New Mexico’s population is 45% Hispanic, the highest Hispanic population share nationally. 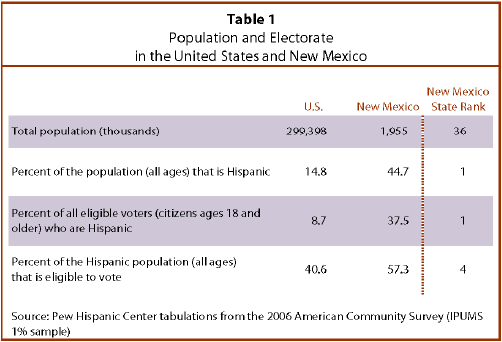 38% of eligible voters in New Mexico are Latinos, the largest Hispanic eligible voter population share nationally. 57% of Latinos in New Mexico are eligible to vote, ranking 4th nationwide in the share of the Hispanic population that is eligible to vote. 29% of Hispanic eligible voters in New Mexico are ages 18 to 29. By contrast, 23% of all New Mexico eligible voters and 22% of all U.S. eligible voters are in that range. Hispanic eligible voters in New Mexico are just as likely as all eligible voters in the U.S. to be citizens by birth—93% in both cases. They are more likely to be U.S. citizens by birth (93%) than all Hispanic eligible voters nationwide (74%). 23% of Latino eligible voters in New Mexico have not completed high school compared with 27% of all Latino eligible voters nationwide. By contrast, 15% of all New Mexico eligible voters and 14% of all eligible voters nationwide have not completed high school. Almost three quarters of New Mexico Hispanic eligible voters live in owner-occupied homes compared with 6 in 10 Hispanic eligible voters nationwide. A slightly greater share of Hispanic eligible voters in New Mexico live in owner-occupied homes than do all U.S. eligible voters—74% versus 71%. Latino eligible voters outnumber Native American eligible voters in New Mexico by more than 4 to 1. Latino and Native American eligible voters are younger than white eligible voters in New Mexico. About 29% of Latinos are ages 18 to 29, as are 33% of New Mexico Native American eligible voters, compared with 17% of white eligible voters. Similar shares of New Mexico Hispanic and white eligible voters live in owner-occupied homes—74% and 75% respectively. A somewhat smaller share of Native American eligible voters live in owner-occupied homes (65%).